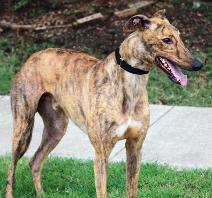 History: Duncan arrived at TAGS after having been retired from the track for over a year. He was well on his way to glory when he injured his right back foot. The prior injury is still evident. Duncan raced at Grade A, AA and Stakes AA. He had 7 wins and 11 seconds in his 48-race career. 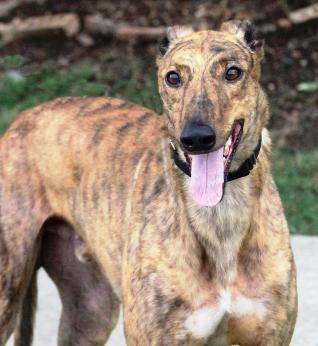 One phrase used in Greyhound Data to describe Duncan was “came flying.” Duncan, like so many, has the Gable Dodge line on one side and Molotov on the other. 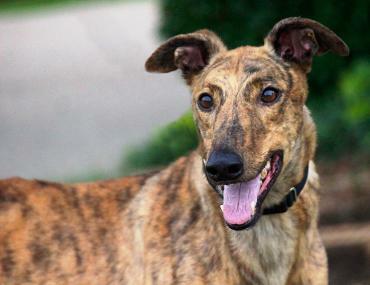 Duncan was part of a 7-dog litter, all of which raced. Five of his siblings are still running. 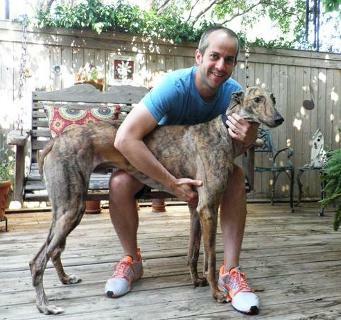 Duncan was adopted and traveled to Odessa with new dad, Jason. 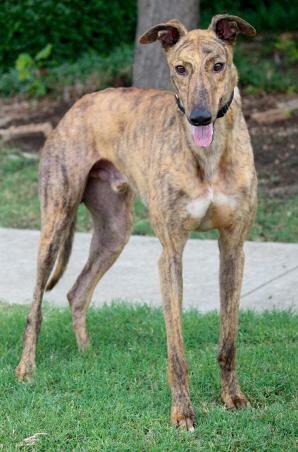 July 13, 2013 update: Duncan adopted and moved to Odessa, TX to live with his new dad. Congrats to both! June 22, 2013 update: Because of the prior pulled tendons in Duncan’s right back foot, his toes are flat and do not lay straight. The inside nail on his back inside toe was digging a hole in the bottom of his foot. At the time he was altered and had his teeth cleaned, that toe was amputated. It has now healed as has the sore on the bottom of his foot. He has been released by the vet. 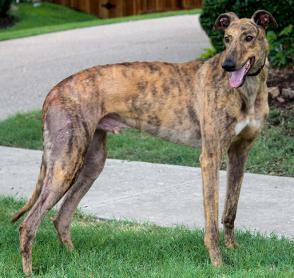 June 17, 2013 update: Like all new Greyhounds, Duncan’s first day with TAGS was a whirlwind – ride from the farm, ride to Frisco for a bath and meet the other dogs and cats there, ride to the vet for blood tests, back to Frisco for a little nap and some photos, then to Plano and another car ride to his foster home. He met the Greyhounds there and everyone is getting along. He took a short nap and now he’s outside marking everything in sight. You can tell he’s new – trying to figure out how to get through the glass French door. He was very hungry and ate all his dinner with no hesitation. 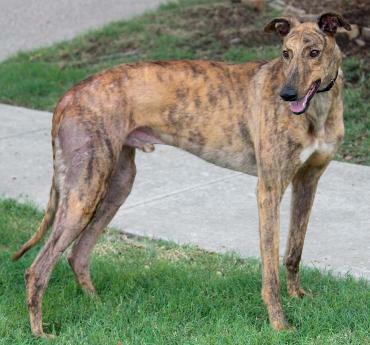 Duncan is a tall, red brindle boy with distinctive markings, which make him very photogenic. He seems to be very friendly. He’ll sleep good tonight after such a busy day.